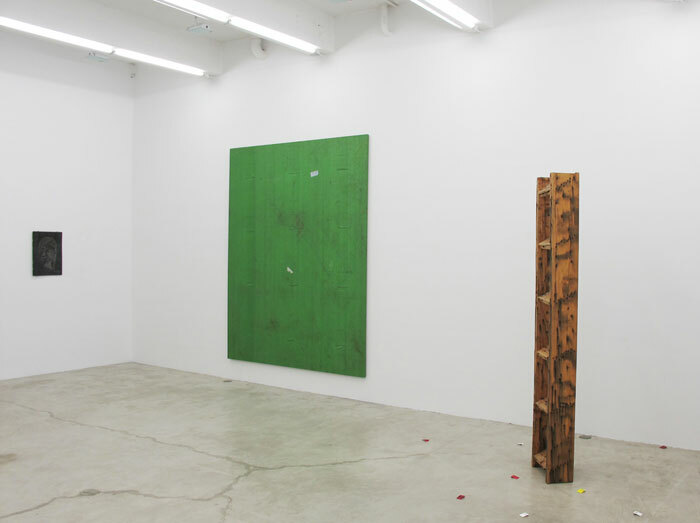 Martos Gallery is pleased to present a three-person exhibition featuring work from Aaron Bobrow, Jo Nigoghossian and Grayson Revoir. The juncture between the limitations and life of industrial materials and the formal art object provides a starting place for the work in this exhibition. These limitations are exemplified in the gestural, figurative and accidental markings that appear on the objects and which act as a record of their lives. 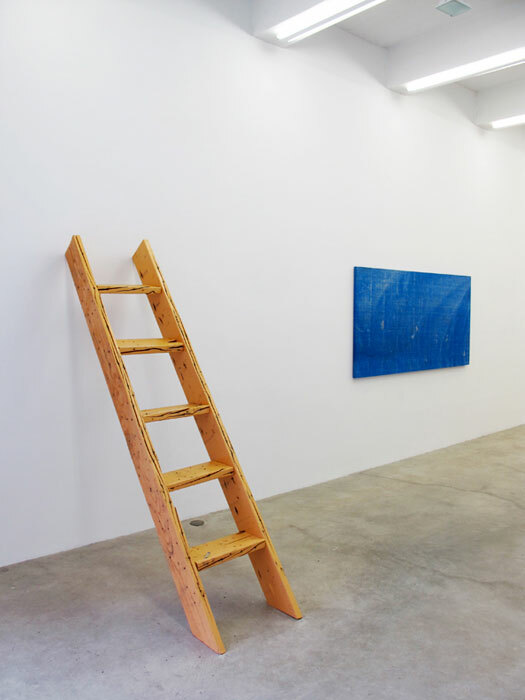 The material similarities between the works, the space and neighborhood insinuate an exhibition born out of location itself. 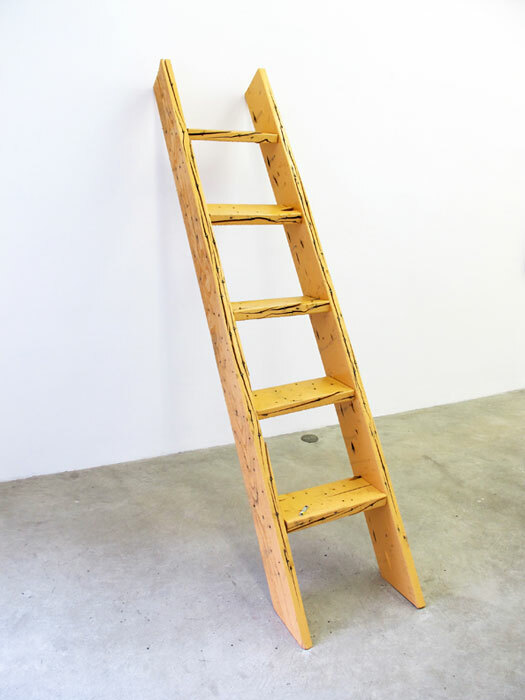 They are the leftovers; neglected ladders carelessly placed aside by errant laborers, tarps covering a hole in the wall and forms built from the remaining cement in a mixer. 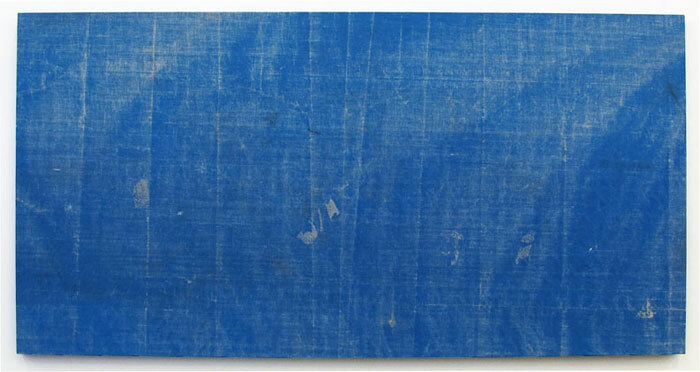 Aaron Bobrow (1985, San Francisco, CA) has stretched tarps into paintings. The tarps have been acquired through a number of means including bartering, purchasing and taking. The nature of the acquisition places parameters on the decision making process, incorporating the accidental in the aesthetic. The concrete forms in the work of Jo Nigoghossian (1979, Los Angeles, CA) occupy a place between creation and completion. The sculptures’ anthropomorphic forms lean, rest and play in a space of suspended animation in which elements of hair, tightly stretched elastic and paint help to complicate interpretation. 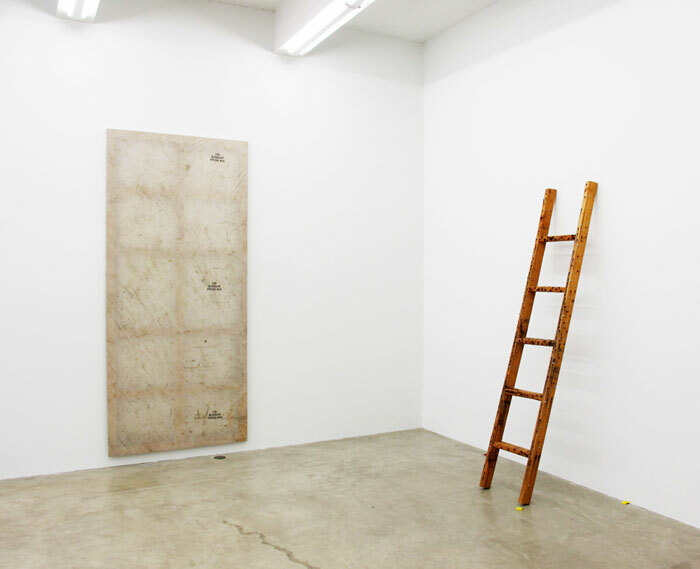 Grayson Revoir (1983, Alamenda, CA) shows work from two series. 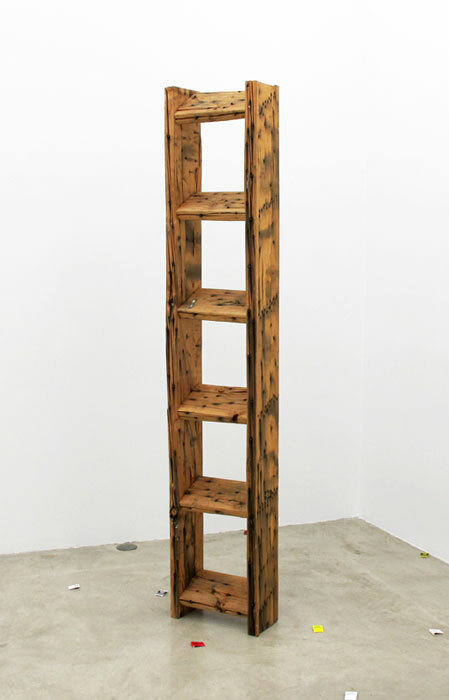 One being a set of ladders that have been left outside rendered functionally useless through the gestural application of nails and the natural process of rot. The other is set of metal plates, similar to the ones used by construction workers to fill holes in the road, on which Revoir has inscribed a variety of motifs.